scans_daily | U.S.Avengers #6 - "The Cavalry Stayed Home"
"Then you joined the establishment" is so damn brilliant. Perfectly encapsulates what a meaningless, catch-all insult for whatever side I disagree with that word has become. Especially since Stevil's Hydra is the establishment. Isn't that a case where it makes sense? 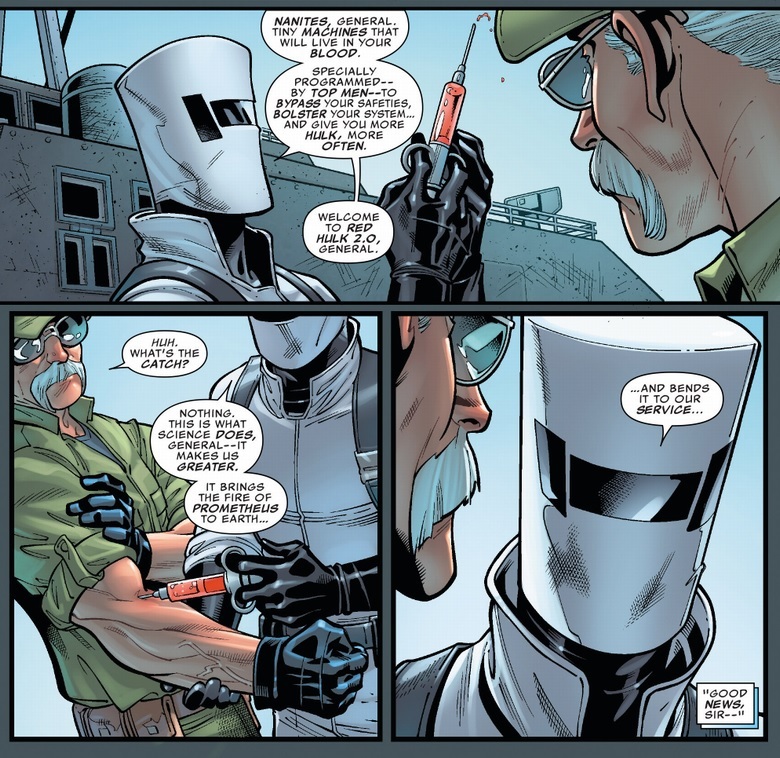 Overall, supervillains are the ones fighting for change and superheroes are the ones trying to prevent it, as the ever-lasting status quo of the medium dictates it. So it does make sense for Doom, AIM, Hydra etc. to see themselves as fighting against the established governments of the world they are trying to conquer. Subsequently, if Larry here is in context a long-term member of AIM, then he spend years working for an organization trying to bring a new world of technocracy, just to see them lose sight of their goal and serve those who toppled their vision again and again. So in context, it IS brilliant since it tells us in few words why characters like Larry would help the Hydra coup out of idealism instead of fear or mind control. Whereas conservatives say left-wing parties never advocate something new but are stuck with failed socialist ideas from the last century. It's all a matter of perspective and of course, propaganda is only what the other side does. Basically the less in power you are, the more you can see your opponents as establishment. ...But then DOOM becomes the Establishment. And a few pages for others. No! Not Larry (from Stores)! Not-Steve's evil knows no bounds! Ewing's evil knows no bounds. He took Larry from us. 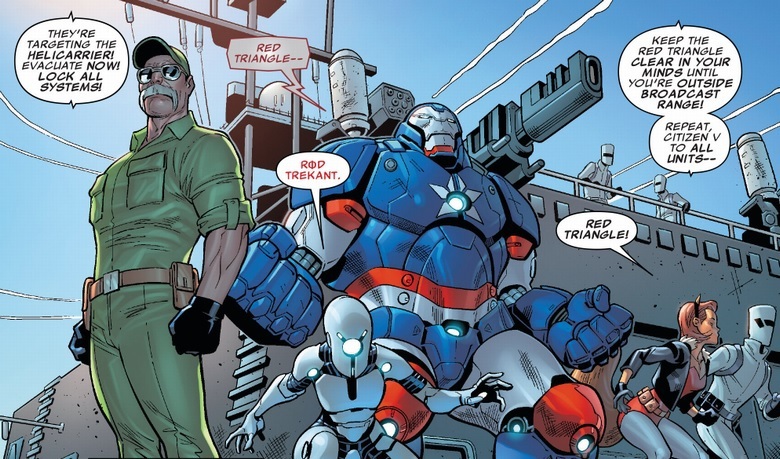 How can I ever read anything with Larry in it again, knowing he's a willing member of Hydra? Ewing has ruined Larry for me forever! I am aware of that. I know of Larry (from Stores), and his... err, fondness for the Supreme Leader. (In fact, given his desire for Roberto to Show Them, Show Them All! back then, this vile betrayal might actually be possibly genuine. Or at least have given Hydra a foothold. 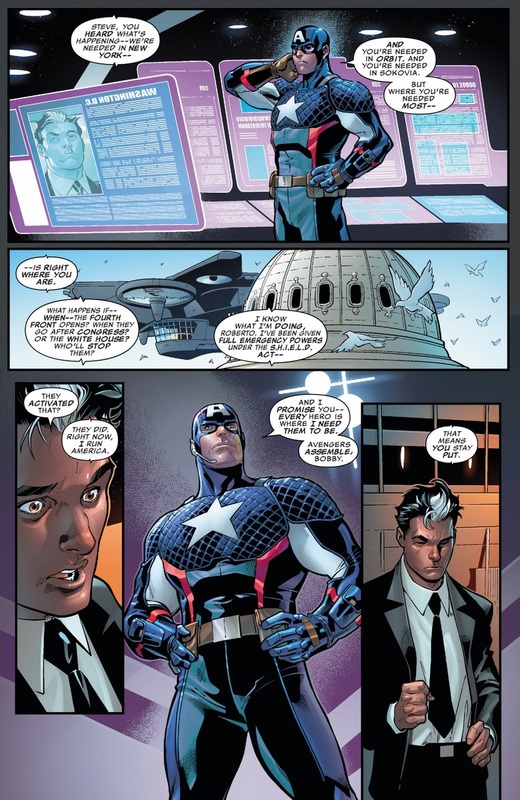 I like Ewing just flat out calling Steve Evil Cap instead of trying to get us to buy into the idea of the noble hero twisted to represent fascism or whatever. 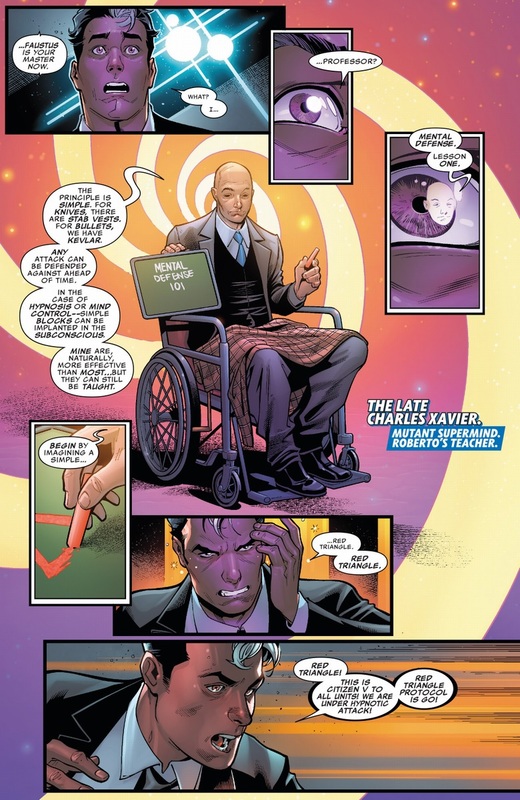 I really loved how they showed that Doctor Faustus mindcontrol is useless to people who were trained by Xavier. This storyline seems to be stretching Faustus past his limits. He's a hypnotist. The mind-power equivalent to The Shocker. Pure bush-league, in his field. Mentallo has it all over this guy. Hell, The Ringmaster has it over Faustus. But now anybody trained by Xavier, or anybody who watched a PowerPoint by somebody trained by Xavier, anybody named Javier, can shake Faustus off with no trouble. That's probably why most mutants anyone that has been trained by Xavier, where moved to New Tian. As for your comparison to Metallo and Ringmaster, neither of them have had schemes at the level of what Faustus has done in previous Cap stories. Metallo hasn't really done much after his old partner Fixer joined the Thunderbolts all those years ago. Actually, Ringmaster was almost successful in using his tech to be elected president. That aside, Faustus, can pull a mind screw, but only on a one on one basis. Mass mindwipe with a few words isn't his wheel set. Normally, but he had help this time. The Shocker doesn't fit my definition of bush league. He often gives Spider-Man a hard time when they fight. It just never got personal in any way, Shocker has no connection to Peter Parker's friends, so the Shocker isn't really A list. In fact, Shocker has more victories over Spidey than Eddie Brock/Venom. Shocker also beat Punisher in one blow. Someone with too much time on his hands once worked out that Shocker actually has the second-best win/loss record of all the Spider-rogues. Only Doc Ock fares better than him. Well color my face red: When I suggested that Dr. Faustus was the Shocker of the mind control set, I was doing a disservice to the Shocker! I will take that hit. A thing about hypnotism though, is it's much more spreadable. 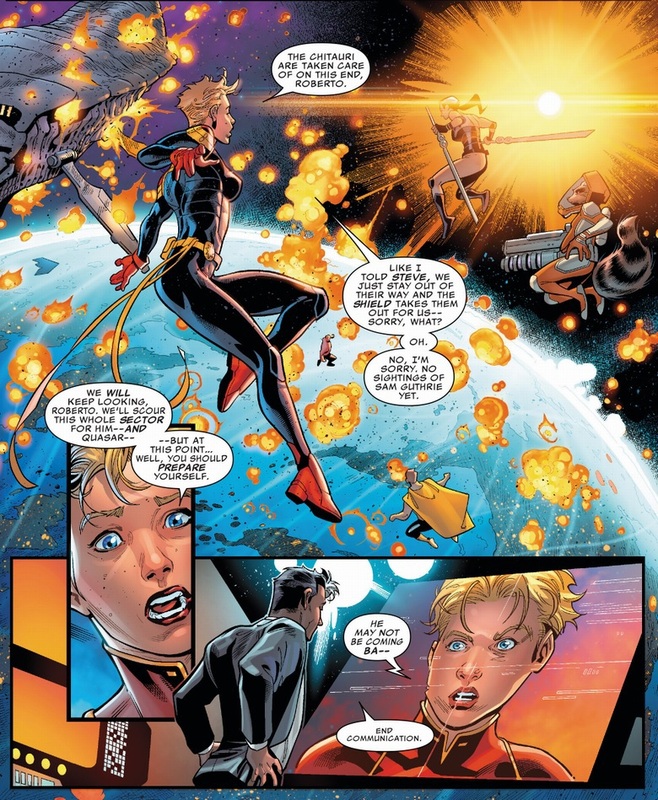 A telepath can normally only affect X number of targets because each one uses more mental power in a two-way contest. A hypnotists can broadcast to a city because it's a technique that is merely projected one-way, their mind is not in direct contact with every target and it's not watered down on any of them. So in order to do something of this scale, you generally need an alpha+ level telepath with a booster like Cerebra. Faustus is more useful in that respect, he's not trying to go mind to mind with everyone. But of course those trained to defend against it are fine, his main advantage is breadth. Sunspot: Super strong, super durable mutant. Is going to go down via an administrative assistant with a pistol? These people run a company worth billions. Why do -I- know their character's abilities better than they do? Except in this instance, you don't. He doesn't go down easily and that's not even a pistol, that's obviously not a bullet. But the fact that a guy who has fought global level threats goes down to a secretary with a gun, even a really -nice- gun, does not scream "Great continuity!" to me. Neither is judging whether something counts as "Great Continuity" by reacting to a panel without knowing the context. And again, you're still acting like that's a regular gun Larry is using. You also seem to have missed how easily Berto shakes off Faustus attempt at mind control and the fact that he seemed to have planned a contingency for such a thing. 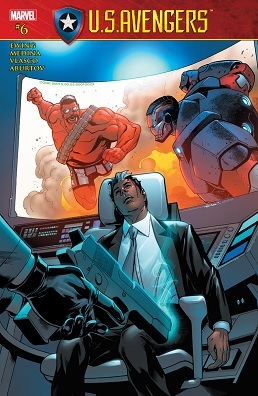 Al Ewing has written Berto as a really smart strategist. We don't even see Berto get hit, so for all we know, it's all part of Berto's plan. Is Roberto supposed to be super-durable, though? I recall he could handle the stresses of using his own superhuman strength, but I don't remember invulnerability being among his powers. I recall the original New Mutants making a big deal of him *not* being invulnerable. The phrase "Careful Bobby, you're strong, not invulnerable!" was one of the lesser recurring Claremontisms. That might have changed since then, but I'm still fine with Bobby being shot, even if he does have invulnerability. If you're specifically planning to shoot Sunspot, making sure you have a gun that can specifically hurt him seems pretty reasonable. One reason I would have found it much more effective for HIM be the one to be casually shot dead back in New Mutants #60 rather than... well, you know who. But since then his energy powers have expanded to include flight and energy blasts. 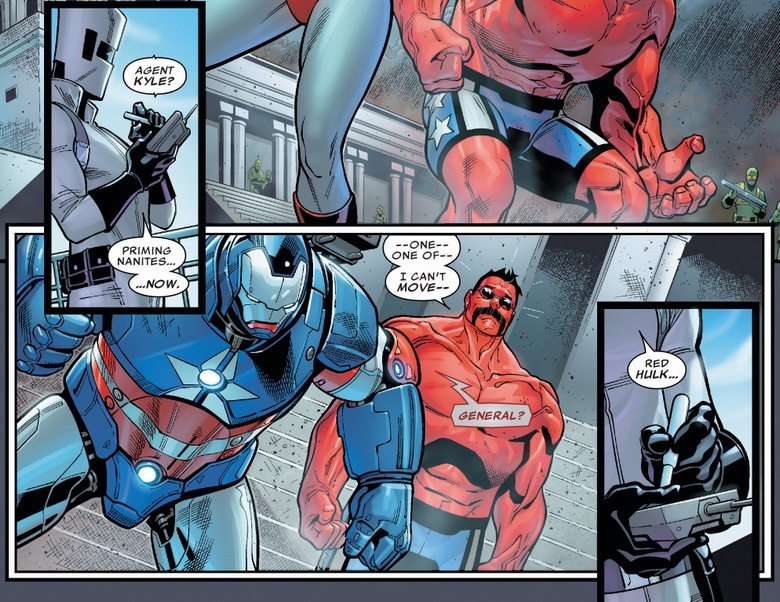 Consider how Cap and Spidey have been retconned to be more durable than most due to dense muscle tissue, and to have regenerative abilities that explain them being fine the issue after a beat down. No New Mutant has ever been enough of a marqee player to get that sort of detailed reexamination of his powerset, but it follows. My google-fu skills are telling me that he survived a bomb blast from the old Scientist Supreme when he was acquiring AIM, and has taken a few punches to the pretty-pretty facemeats from Smasher. 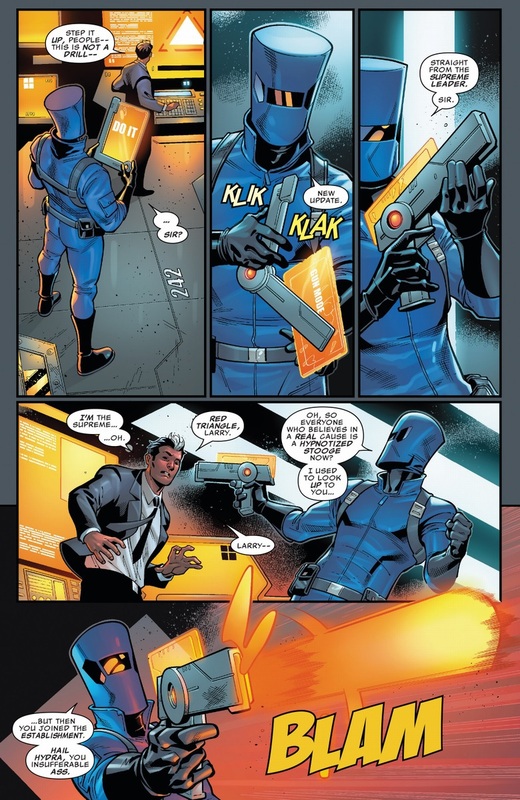 This on top of the fact that he has energy absorption powers and the gun directed at him is clearly an energy weapon. But Cap and Spider-Man aren't immune to blasters, either. Heck, they're not even impervious to regular handguns. Plus, they're strength comes from their muscles, so dense muscle tissue follows. That's not the case for Sunspot, whose strength comes from channeling sunlight. Sunspot can specifically absorb heat because that's his energy source. He can't absorb all forms of energy, and nothing says Larry's gun is a heat ray. 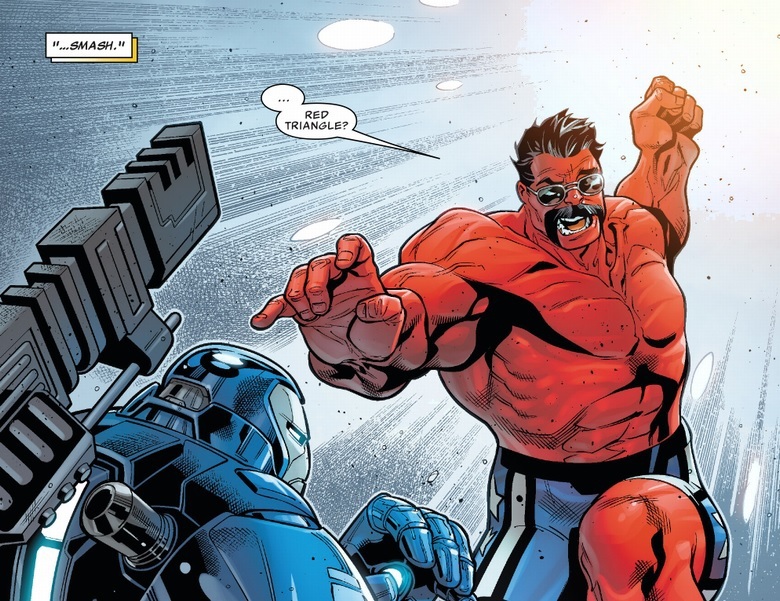 I'd call the Smasher scene a mistake, from a writer forgetting how his powers are supposed to work (unless there was an in-story explanation of "I'm now invulnerable, too" which I don't recall there being), seeing as how it's inconsistent with portrayals both before and since. Apparently his energy absorption has changed too, as he recently absorbed gamma radiation from a janked-up Abomination. As for the bomb and Smasher: either they screwed up then by not aligning to old continuity, or they are screwing up now by not aligning to their newly established continuity. I've read that issue. Gamma radiation was portrayed as something he could barely absorb and only with strain, on the edge of his abilities. Trust me, the Roberto in that wasn't someone who was going to be brushing off a gamma ray-gun blast. Is it 'newly established continuity' if it's a mistake? I mean, sometimes mistakes get accepted as continuity just because they keep happening. Originally, the idea was that the Vision absorbed solar energy through his gem but *fired* it through his eyes. But their have been so many comics where he's fired it out of his gem that it's become an accepted part of the character. But there hasn't been a similar long history of super-durable Sunspot. In any case, have we at least established that there's considerable variation in the portrayal of Sunspot's powers, so that it's not the blatant continuity error you were making it out to be initially? As James Bond weapons go, I do kinda love the tablet gun. 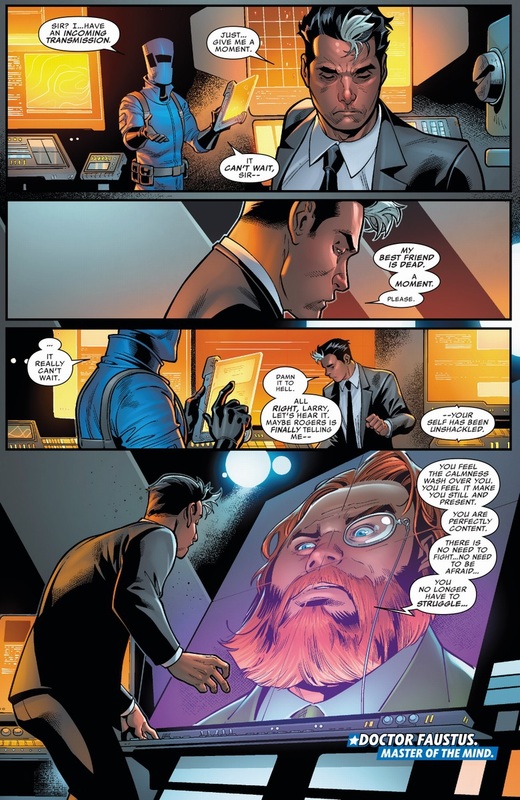 Question: what are some other scenes where Xavier's mental training manifests as the professor talking to the user? Rogue did it in one of the Standoff tie ins in Uncanny Avengers and it seems like a narrative concept that's been used elsewhere.